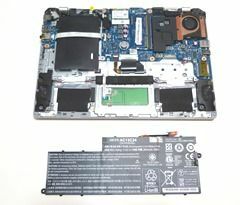 Ultrabooks have sealed in batteries for a number of reasons and the primary reason is to save money. Removable batteries require protective casings and additional electronics that can be expensive. That casing also increases the size though and in an Ultrabook, that can be a problem. By using multiple Li-Polymer cells wired and taped together there’s less weight, less cost and often a more flexible way to shape the battery into space left inside the chassis. The end result is more capacity per weight and that’s good. There’s also the problem of carrying a spare battery. A spare battery often weighs less than a mains charger and if you’re only out for a day it makes sense to go that route. Some designs use a sealed internal battery and offer an external ‘slate’ battery. 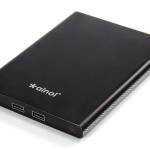 Some external slate batteries can be charged standalone too which is what you’ll find on the Sony Vaio Duo 11. Batteries, however, lose their capacity over time and as we all know, old laptops don’t last long without mains power. For those on the road that’s a brick wall and replacement is needed. Getting a service center to replace a sealed battery is going to cost you 100-150 $/€. Doing it yourself is going to be half the cost but sometimes it’s not easy to find the part or even remove the old battery. For some, a replacement laptop is the easiest option. 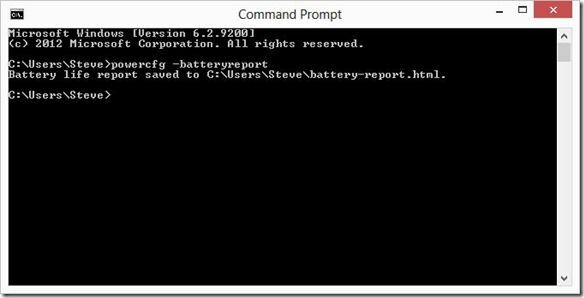 All Ultrabook batteries should give you 300 full charge cycles and retain over 75% capacity without the user having to do anything special to preserve battery life. It’s enough for well over a year of good charge capacity for most people and much more for others as they rarely do a full-to-empty charge cycle. Quality varies though and some high quality cells will last much longer. Unfortunately, unless the manufacturer tells you otherwise, you’re probably getting a standard quality cell. There are ways to improve the life of your battery and you’ll find them below but first, how do you check your battery? Read the next section and let us know your results in the comments below. 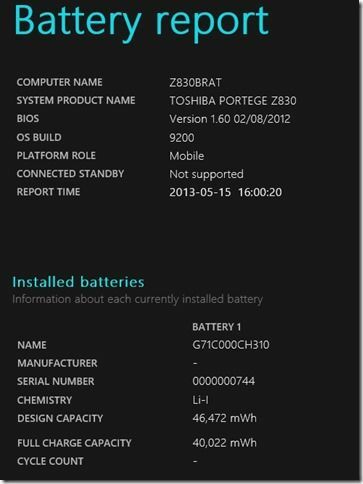 Check your Ultrabook battery health. By collecting data from readers here we should be able to get a picture of how long the sealed batteries are lasting. If you have the chance, please report your figures (with the age of the device) in the comment below. 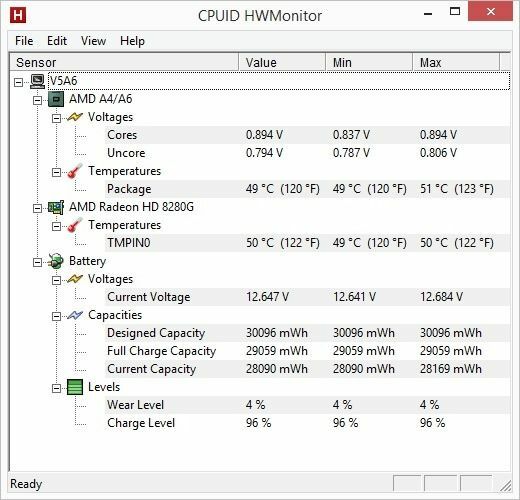 Download and install CPUID HWMonitor. In most cases, HWMonitor will report the design capacity, the current max capacity and the wear rate. 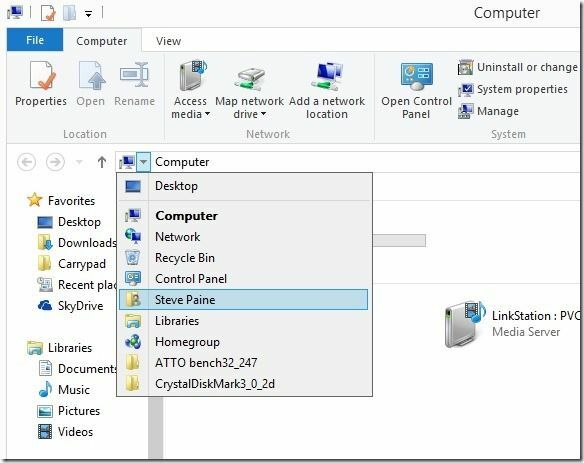 I’ve seen HWMonitor lock up laptops before so be careful to save data beforehand. 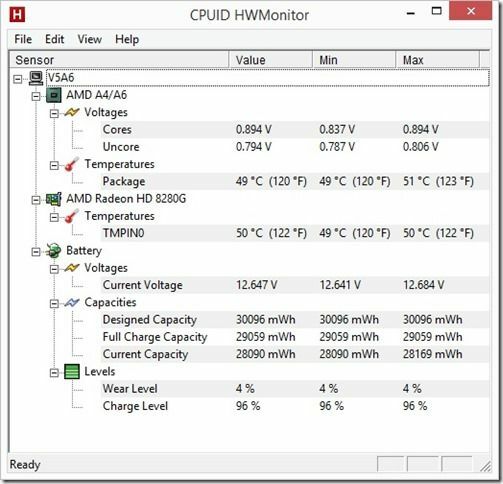 The report shown above is for an Acer Aspire V5-122P that is about one month old. 4% wear level. 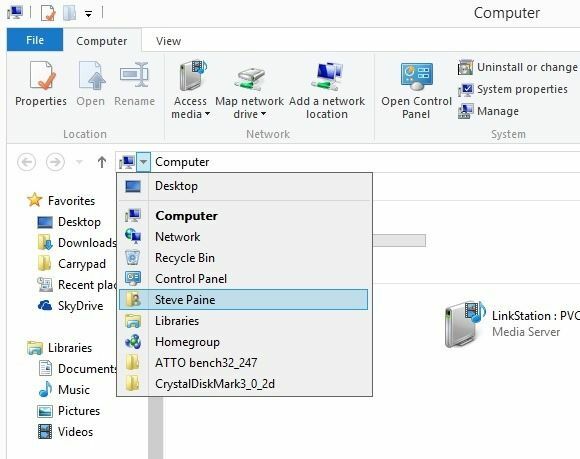 Now open a file explorer [Windows+e is the shortcut] and navigate to your home directory. Double click on the battery report file which will open the report in your browser. Here’s the top section of a report from an older Ultrabook. You can see the full charge capacity of 40,022 mWh and the design capacity of 46,472. The wear rate here is 4%. Tips for preserving battery capacity. Charge cycles and extreme usage kills batteries. The good news is that with Ultrabooks being some of the most efficient laptops out there, the number of charge cycles needed is less than with other laptops. However, there are a few key rules that must be followed in order to keep the battery as active as possible. Avoid extremes. Trying to run a laptop on the last 10% of battery capacity isn’t good, as is charging beyond 80%. It is at these extremes that a lot of the damage is done to laptop batteries. There’s no memory effect in Ultrabook batteries so partial charging is OK.
Keep the battery as cool as possible. This is a difficult one to achieve but consider a fan-assisted laptop stand and removing the battery, if possible, when you’re going to use a laptop as a desktop for a long period of time. (Be careful that the power plug can not be accidentally pulled out. Charging a battery while a laptop is in use is usually one of the warmest scenarios so try and avoid that if possible. Samsung Ultrabooks have a Smart Charging mode which prevents the battery from being charged over 70-80%. If battery life is not critical, turn this feature on. More detailed information on Li-Ion and Li-Poly battery health can be found here. Don’t forget to report your battery wear and device age below and if you’ve had any strange experiences with Ultrabook batteries, let us know. This is why I get notebooks and smartphones with replaceable batteries. With notebooks, I get the ones with extended batteries so I don’t take much of a battery life hit when charging only up to 75%-80%. Li-Ion batteries also have a shelf life and lose capacity as time passes no matter how well you maintain it. Too bad thinness is being prioritized too much these days (at least from my point of view). I’d always get the thicker device that has extended battery options and better performance (ie. no cTDP down, SDP and shorter than normal Turbo times). I used Batterycare since I got it + almost all the time Samsung Smart Charging (max 80% battery). I used it for the uni really often, killing 30-40% of it and charging it to 80 during the night. UX31E here. Had it for over 1.5 years now. BatteryBar reports 17.0% battery wear, though I have seen it go up to 20.7% before. No idea why it fluctuates. I’ve kept it plugged in most of the time as the laptop can hard shut-down randomly when on battery. It’s quite easy to keep wear levels to a minimum by observing the rules recommended in this article. My XPS 12 was at 0% degradation for 5 months, and 7 months in now its at little over 4%. 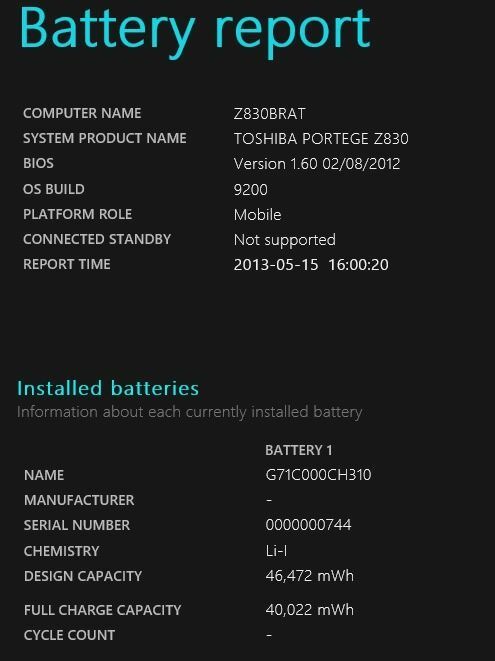 I’ve had the ultrabook for two weeks now, and have been using it on battery almost everyday. It’s currently at 11 charge-discharge cycles and wear level is 0%. Strangely, the design capacity is 57Wh, however the full charge capacity is 60Wh! The battery used in this ultrabook is a 4-cell lithium ion rated at 7.6V. That should mean 2S2P arrangement, so 2 sets (consisting of 2 parallel cells) in series. At full charge (100%) the battery voltage is at about 8.3V, which is 4.15V per li-ion cell. Battery charging does stop when the battery is at 100%. Ideally WIndows would offer a ‘no charge above 70%’ option though, like the Samsung’s do. There always was a mechanism that batteries from overcharging. Otherwise, they’ll blow up. Also, several of the good quality notebooks have adjustable thresholds where the user can specify at what percentage to start and stop charging. It’d be nice if reviews mentioned this. It’s also not good to keep the battery at a specific charge level for a long time unless it’s removed for storage. I don’t bother with any of this. I charge to 100% because I want to max out my battery life. I let it discharge until I get critical battery warnings and I’m forced to shutdown when I’m away from a plug. If the capacity drops enough I just replace the battery. Any device with a sealed battery is an automatic no buy with me. I have a ThinkPad T420s with a regular battery (Sanyo) and an Ultrabay battery (Sony). I’ve had the notebook for 2 years now. The Ultrabay battery is always discharged completely to 0% before the regular battery is used so it gets the most use. Right now, the Ultrabay battery has 98% of it’s original capacity while the regular battery is at 93%. On the flip side, I have an X230 for work with a battery (Sanyo) capacity of 89% after 6 months. The IT department set the start and stop charge values at 40% and 80% and I rarely go below 20% before finding a plug. Anyone actually have numbers of how much these battery tips actually affect the battery’s ability to maintain a charge? Yeah, the theory is there but does anyone have any actual numbers or even some equations that can quantify the theory. From my experience, it’s negligible and you’re more affected by having a bad sample and/or a battery from a bad manufacturer. Is it possible that some battery makers artificially make the 100% mark reported to actually be less than the real capacity so users don’t have to worry about all these charging tricks? The same might be done on the low end as well. That could explain the opposite results you’re getting. It’s similar to SSD makers lowering the actually drive capacity even after the whole GB to GiB thing for extra over-provisioning. Sorry, but they do work, and I’m inclined to say you are even being ignorant. You can simply see whether it works if you ever played with RC Airplanes and Helicopters using batteries. They use the same Li-Poly tech, and NOT observing rules will drastically reduce their lifespan. It may be an exaggerated scenario with varying quality of batteries and more intensive use than on computers, but it can’t be ignored. Did you even read the comment or just the first sentence? It apparently doesn’t work for him very much. He actually got the opposite results. You’re comparing dumb batteries (probably also used with dumb chargers) to the “smart” batteries in notebooks. It’s not far fetched that notebooks targeted for businesses will actually charge the battery to less than the max possible voltage (4.2 V/cell is the usual max on Li-ion batteries but they can actually go up to 4.3 V/cell which is always prevented in all batteries) through firmware in the battery itself and say it’s at 100%. The same is done on the other end where the 0% is determined by some voltage higher than the real shut off voltage. I guess these tips would help with consumer notebooks that probably succumb to more cost cutting measures than business targeted ones. I just ordered an ‘old’ Samsung 900X3C, as a run-about, cause I wanted to avoid a glossy touchscreen, so I’m happy to find out about Samsung’s charge-limit settings. Sadly, that’s what I’m doing, so my batteries are usually overdue for replacement every time I come back after year or so. hkckoo, no manufacturer does this. The problem with having it plugged in at 100% is that there is a natural, but very small drain in battery capacity even when you are not using it(and accelerated somewhat by heat). So the charger will “trickle charge” and keep it at 100%. 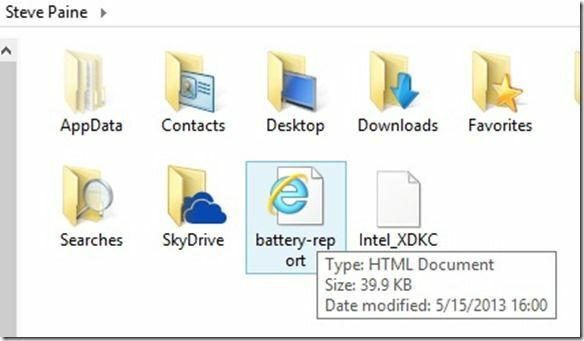 The problem is that Li-Poly batteries used in Laptops hate being stored at 100%. By using your Laptop/Ultrabook like a “Desktop” plugged in for months on end, you are practically having the battery stored at 100%. In about 2-3 years, the capacity will plummet to 10-20% of original using it that way. Actually, yes I did. There are always few people that get opposite results from what the masses get and believe. That’s because no testing environment is the same. It’s like there are few smokers who live to 80+ years smoking a pack or more a day for 50 years, but in the most cases, average person dies or suffers from smoking related issues far before that. Now imagine if the roles are completely reversed. But you’d say in general its bad for you. Imagine how badly the 40-80% battery would have performed if he didn’t take such caution. It’s probable that it would have ended up worse. But manufacturing isn’t perfect, and you will always find a bad part, no matter how good the process and how expensive it is.